The fourth biggest bank in Ukraine, Delta Bank, has gone bankrupt after months of non-compliance, according to the National Bank of Ukraine. 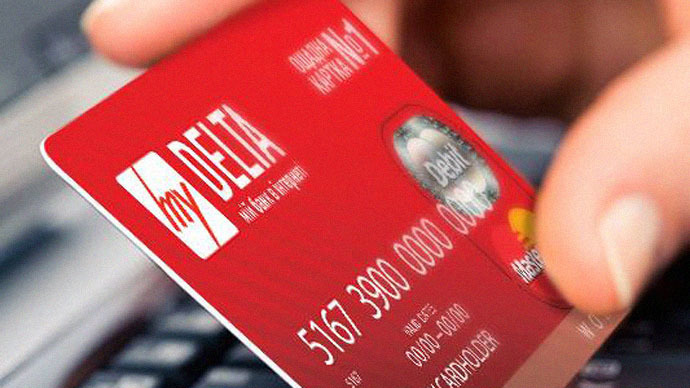 Two smaller banks in the Delta Banking group have also gone belly-up. “The National Bank of Ukraine (NBU) adopted a resolution on the assignment of JSC Delta Bank to the category insolvent on March 2,” says the NBU website on Tuesday. The failure of Delta Bank owner's to take timely, efficient and sufficient measures to restore the bank's financial health and viability and bring its operations into compliance with Ukrainian laws was given as the main reason for the NBU’s decision. “The principal shareholder and the management team of Delta Bank JSC have opted for a high-risk strategy of rapid growth through the acquisition of poor-quality assets,” the statement said. Ukraine's monetary authorities have appeared desperate and nervous in their attempts to try to save the country's ailing economy. On Tuesday, Ukraine’s Central Bank announced an increase of its benchmark rate to 30 percent from 19.5 percent as part of a package of measures aimed at saving the collapsing economy and stabilizing the country’s financial system. The move came after the bank’s decision last week to end currency controls to stop the currency free fall. The Ukrainian hryvnia has lost half of its value in the last two months. However, the decision was overturned in less than 24 hours after criticism from Prime Minister Yatsenyuk and President Petro Poroshenko’s of the country’s Central Bank head Valeriya Gontareva. On Monday, while revising the country’s budget for 2015 and introducing austerity measures, the parliament adopted a law which imposes greater responsibility upon bank owners and management for a financial institutions' performance. The move is aimed at enhancing the banking sector’s resilience and ensures the protection of depositors' and creditors' rights. "The process of purging the banking system aiming to wind up insolvent banks and address the problems that have piled up in the banking industry over the years is still under way,” Gontareva said while commenting on the decision to declare Delta Bank insolvent. Kiev-based Kreditprombank and Omega Bank that form part of the Delta Banking group have been categorized insolvent along with Delta Bank. They have been experiencing deteriorating financials after involvement in risky activities, according to the NBU’s statement. In January, both were declared problem banks. On Monday the NBU declared them insolvent as they continued violating National Bank regulations, with their owners failing to take appropriate measures to provide the necessary financial support. In September NBU issued $165 million worth of credit to Delta Bank to support liquidity, and after agreeing a bank capitalization program issued a stabilization credit of about $39 million secured by notes guaranteed by the government. However, those measures have only temporarily stabilized the bank’s situation. Considering the poor quality of Delta Bank’s assets, the “regulator was compelled to approve the decision to declare the bank insolvent,” NBU stated. Delta Bank was founded in 2006; it was ranked fourth among the 158 operating banks as of January 1, 2015, with total assets worth $247 billion.